One of the basic essentials in any personal care routines is a bar of good quality soap and this is exactly what Mirah Belle Cedar wood Amber Men Soap is all about. It captures the nature's essence in a soap which provides the essential moisture, fragrance and gentleness to the skin. This soap does not contain any animal based substances, toxic chemicals which could cause harm or cause allergies to the skin. Mirah belle strives towards using ingredients that ensures that your skin stays healthy. Additionally, this soap is meant for all skin types and does not dry out the skin which is common with traditional soaps. 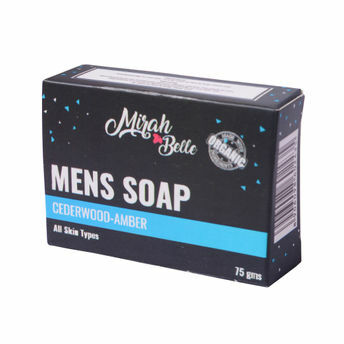 Amber Fragrance Oil: The soap is fragranced with Amber fragrance oil which gives a highly sweet smell with wooden and earthy notes and is produced from a blend of different resins. Amber is generally made from labdanum resin and gives an incredible warm fragrance. Cedar wood Essential Oil: The soap also contains cedar wood essential oil which helps boost hair growth, prevents inflammation, reduces the pain associated with toothaches, strengthens the gums, reduces redness and skin infections, is an antifungal agent and can help to clear out any acne from your skin and give your skin a healthy glow. Cedar wood essential oil is also known for its ability to flush out toxins from your skin. Organic Soap Base: With the healing and skin benefits of cedar wood oil and the aroma of amber, set in an organic soap base, this is one of the best men's soaps available in the market. Explore the entire range of Soaps available on Nykaa. Shop more Mirah Belle products here.You can browse through the complete world of Mirah Belle Soaps .